Rustin Gudim/The Aspen TimesFire danger was rated as moderate Friday in the Aspen area, as noted by a sign east of town on Independence Pass, but fire officials are watching local fire conditions carefully. ASPEN – Aspen and the Roaring Fork Valley enjoyed nearly two straight weeks of sunshine heading into the work week. That means fire danger is on the rise. Fire danger in the Aspen area remains moderate, according to Fire Chief Darryl Grob, but at lower elevations, the danger tends to mount more quickly. Scott Thompson, Basalt fire chief, said the danger in the midvalley was high on Friday, and had been for about a week. “I get nervous when it starts pushing into the extreme,” he said. Still, Basalt firefighters were called to douse a grass fire in the Willits area Thursday that spread quickly even though vegetation was still green, Thompson said. With the July 4 holiday nearing, the use of fireworks can escalate the risk of grass and brush fires. “People need to let the professionals play with the fireworks,” Thompson advised. Grob said he’ll be monitoring conditions on a daily basis this week, and has asked the Aspen Skiing Co. to begin watering the lower slopes of Aspen Mountain in preparation for the town’s Fourth of July fireworks display. Wildfire season is well under way in Colorado, where multiple fires are burning around the state. A 630-acre wildfire burning near Canon City, which officials said was human-caused, was contained on Friday, but fires were also burning in Rocky Mountain National Park and in Great Sand Dunes National Park. The 170-acre Water Creek Fire on the Roan Plateau, north of Rifle, continued to burn, but wasn’t growing, according to the Bureau of Land Management. The fire wasn’t being suppressed; fire managers were letting it burn to clear dead vegetation and stimulate new forest growth. The fire, sparked by lightning, was burning at about 9,000 feet in a spruce-fir forest, noted David Boyd, spokesman for the BLM in northwest Colorado. Aspen is at 7,900 feet. 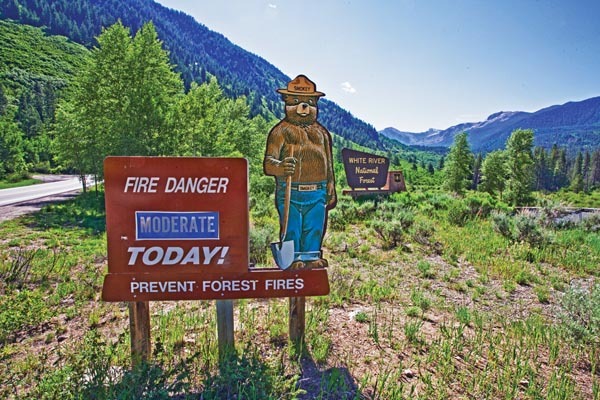 The BLM’s Colorado River Valley field office, which oversees BLM lands in Pitkin, Garfield and Eagle counties, plus small parts of Routt and Mesa counties, has not yet issued fire restrictions, but they’re likely in the offing, Boyd said. “It’s very possible by next week we will have some,” he said Friday. That will mean, for one thing, campfires outside developed areas will not be permitted. Already, people should be careful about driving vehicles on dry grass, using charcoal and dumping ash, and with campfires, Boyd added. “There is definitely elevated fire danger out there,” he said. No fire restrictions are yet in place in the White River National Forest that surrounds the valley, and area counties have not taken that step, either. Usually, Pitkin County will follow suit with fire restrictions when conditions in the lower valley warrant them, Grob said. “Certainly, when conditions down there deteriorate to the point that they have to talk about burn bans, we’re typically just a few days behind,” he said. County sheriffs actually make the call when fire restrictions go into effect; a wildfire team made up of area sheriff’s office officials, fire chiefs and the Forest Service will probably convene for the first time this season in the near future, said Joe DiSalvo, undersheriff in Pitkin County. During the fire season, the group meets weekly to discuss fire danger and preparations to respond to a wildfire, DiSalvo said. The “monsoon season,” marked by regular afternoon rains in the mountains, typically begins in July. The forecast for Aspen into early this week, however, called for just a 20 to 30 percent chance of showers and thunderstorms. The first clouds and sprinkles in recent memory moved in Friday afternoon. That’s worrisome, DiSalvo said. A slight chance of thunderstorms can mean lightning but no rain. “That’s the recipe for fire,” he said.